When the selection process for the first group of US astronauts was begun, in late 1958, one of the requirements for selection was to be a graduate of a test pilot school, either the Air Force or the Navy. In the two decades since then, it has been a truism that if there is a sure path to selection as an astronaut, it is to have a test pilot background. Of the 56 pilot astronauts selected between 1959 and 1969, over half were test pilots. Of the two schools, the Air Force Test Pilot School is the older having celebrated its 35th year of operation in 1979. This article seeks to examine its curriculum and the reasons why test pilots are so often selected as astronauts. Present Curriculum If one was to compare the test pilot school to a college course, the nearest would probably be a PhD in flying. The school combines the most demanding parts of college and pilot training. Two classes are conducted a year with approximately 25 students in each. Two-thirds are pilots, the rest are flight engineers/navigators. Most are Air Force personnel but each year, there are several civilian, Navy and foreign students. In picking students, the selection board concentrates on three areas. First is flight experience. The school seeks students with time in several types of aircraft. An informal guide is five different aircraft (not including training aircraft). The total number of flying hours and the ability to handle unfamiliar situations is, also, important. The second area is officer qualities such as honesty, self-discipline and a high efficiency rating. And finally - education; a degree in engineering, math or a physical science is among the requirements. The selection board looks at both the subjects covered and the grades achieved. The school looks at such things as efficiency reports and promotion records. They, also, seek letters of recommendation from people the prospective students have flown with; preferably test pilots but, also, squadron commanders. After the tentative candidates are selected, they are brought to Edwards Air Force Base; they tour the school and make five evaluation flights with instructors. This is to determine their suitability. If they pass this test, they begin the 46 week course. This careful selection insures that both the most qualified students are selected and keeps the wash-out rate to only 2%. The typical student is a Captain, 31 or 32 years old with nine years in service and 1500 hours flight time. About half have Master degrees; the other have taken at least some graduate courses. Approximately 80% are married. By the late 1970's, only a small percentage had any combat experience. During the mid-part of the decade, it was almost 100%. The students could be described as achievers, finishing high in their flight training and winning awards. Most had wanted to be test pilots since childhood. The curriculum is divided into three approximately equal parts — performance, flying qualities, and systems tests. With only a few exceptions, the pilots and the flight engineers take the same academic courses. The major difference occurs in the flight curriculum. The first phase covers aircraft performance. During the 11 week course, the students cover such areas as pilot static systems, take off and landing, climb, acceleration, turning performance, cruise, range and propulsion. The instructions cover three basic areas — theory, flight test techniques and flight curriculum. The instructors are all graduates themselves; the highest percentage of any western test pilot school. The classroom lectures first cover the theoretical aspects of a particular test often on a highly mathematical basis. Next, the flight test techniques are covered. This is essentially a mass briefing of the class on how a test is to be done. It covers such things as altitude, speed, radio call signs and data analysis. The students are, also, cautioned about any hazards. An instructor then makes a check flight with the student; the instructor demonstrates the test and has the student practice it. The student learns to fly with a precision and skill he never before thought possible; such as controlling air speed to within half a knot or holding the aircraft in level flight even while accelerating through supersonic Mach numbers. After the student is certified, a data flight is scheduled. Flying is done in the morning. After the first period of flying, the aircraft are re-fuelled and any necessary maintenance is done. A second period of flying is then undertaken. The aircraft (T-38, F/RF-4, KC-135, A-7D) are drawn from those assigned to Edwards Air Force Base. Unlike earlier years, the aircraft are not now assigned directly to the school. Classroom lectures begin at 1.30 p.m. and run for three hours. For some tests, the pilot is tearned with a flight test engineer. During the mission, the engineer operates the data recording equipment switching it on and off at the proper times thus reducing the pilot's workload; he also monitors the quality of the data. The data, recorded on multi-channel magnetic tape, vary from one test to the next. An example might be angle of attack, temperature, speed, altitude and control position up to about 40 channels in all. The pilot also records information on a knee pad and a voice recorder. The tape cassette is taken to the school computer for data reduction. Use of magnetic tape is a comparatively recent change in procedure. From the school's founding in 1944 until the mid-70's, the data were recorded on film and/or oscillograph paper. In the first method, the aircraft carried a duplicate instrument panel which was photographed in flight. After the film was developed, the student would transcribe, by hand, frame by frame the instrument readings. The oscillograph paper is a long strip chart on which the various characteristics are recorded. It was hand transcribed. The data was then "normalized". It was mathematically converted to standard conditions (temperature, air pressure, gross weight, etc.) and plotted on charts and graphs, a long tedious process now done by computer. All that is required now is to configure the computer for the required program. If the tedium is eased for today's student, he must do more tests than his predecessor, so it evens out. The data are then analyzed by the students and assembled into a report. The student looks at how well the results conform to theory. And if not, why not; was it good data and what does it all mean? After the report is turned in, it is reviewed by the staff on several levels. First, in regards to format (margins, spacing, etc.). Then the student is graded on how well he communicates the information; then on how well the student learned the particular test. And finally, how well the data was analyzed. At the completion of the project, it begins all over with another series of theory, flight test techniques, etc. The performance phase includes a performance evaluation of either an A-37, T-38 or an F/RF-4. The students are divided into data groups, four to six students per aircraft. Each student makes all the data flights. After they have been completed, the students pool their data to assemble a written report. The tests for this phase have a rigid standardized format. Data are pooled to insure accuracy and statistical relevance. This evaluation is identical to that done on a prototype aircraft. The course requires a tremendous amount of sheer hard work. The students must put in long nights and week-ends at data reduction and study. It is not unusual for students to go to-the school at 2 a.m. to run their tapes. It is often an around-the-clock schedule. At any one time, a student will be studying the day's lecture, reducing data, writing a report, studying an aircraft handbook and reviewing for a test. The grind takes its toll. The students are compulsive achievers; they want and need success. They drive themselves to do better. This puts stress on both the student's personality and his relationship with others. In an attempt to reduce the grind, there are 2 one-week free periods and field trips to the Navy Test Pilot School and contractor facilities. There is so much for the student to do, their wives arc warned, at the start of the course, that for the duration, they will have to run the house and take care of the kids exclusively. If they need a shoulder to cry on, they are told to see one of the instructor's wives. They have all been through it before. The Test Pilot School's curriculum was modified in 1961 to include training for space flight. 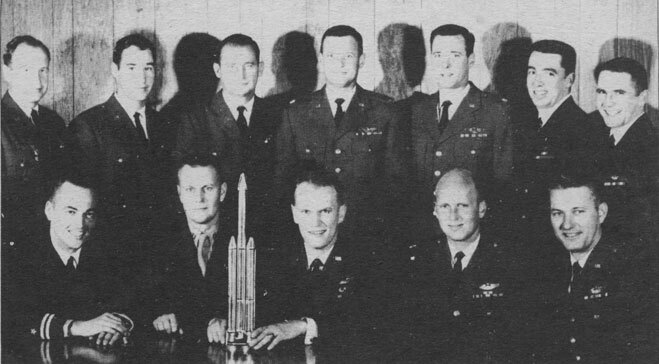 These are the men of the first two groups selected to fly the USAF's Manned Orbiting Laboratory. Left to right, back row: Taylor, Neubeck, Lawyer, Crews, Macleay, Finley, Truly (STS-2 astronaut); front row: Crippen (STS-1 astronaut), Overmyer (Shuttle astronaut), Bobko (Shuttle astronaut), Fullerton (STS-3 astronaut), Hartsfield (Shuttle astronaut). The second phase is a more complicated one — duration is 18 weeks including one free week. The flying qualities phase, like the first, is divided into theory, flight test techniques and flying curriculum. Flying qualities is a more extensive field than performance, covering the aircraft's behaviour in flight and the pilot's control over it. This, in turn,, relates to the aircraft's overall effectiveness. During the theory section, a particular emphasis is placed on the mathematics of aircraft handling. The students cover vectors and matrices, operational math and equations of motion. The course covers how various factors interplay to affect aircraft behaviour. The NASA/Air Force series of experimental lifting bodies (I. to r..- X-24A, M2-F3 and HL-10) flew between 1965 and 1975. The resulting data helped in designing the Shuttle Orbiter. The differential equations of motion describe the behaviour of all aircraft. But because of the design of each aircraft, certain terms will have more importance than others. Also covered are stability, high angle of attack, engine out, manoeuvring, flight dynamics and operational handling. The flying curriculum makes use of both conventional aircraft (A-37, T-38, sailplanes, KC-135 and F/RF-4) and variable-stability aircraft such as a B-26 and T-33, outfitted as variable stability trainers. As with the performance phase, the classes are again divided into data groups to conduct flying qualities test programmes on an A-37, T-38, A-7, F/RF-4 or KC-135. Each data group flies only one aircraft. Students fly a different aircraft than the one assigned in the performance phase and also work with different people. Each data group evaluates its assigned aircraft using military specifications. This document covers all facets of aircraft handling and rates each as either level I (completely satisfactory), level 2 (has deficiencies) or as level 3 (unsatisfactory). The ratings cover such areas as handling qualities, stability and manoeuvring. There is an important difference in the flight testing. During the performance phase, the tests were rigidly detailed. During the flying qualities phase, the students are given a list of limitations. The students have more responsibility for flight test and planning. After the data groups have completed their tests, a report is assembled. It is given in an oral briefing to an audience of staff and guests. The school places great emphasis on communication skills. The staff believes that information is useless unless it can be effectively communicated. The briefing covers how well the aircraft can perform its mission. An aircraft may have excellent performance, but if it is unstable, or the demands it makes on the pilot are excessive, it is both dangerous and useless. The question is: Will this or that poor flight characteristic be detrimental or is it not important? With these questions answered, the student moves into the final phase of the course. 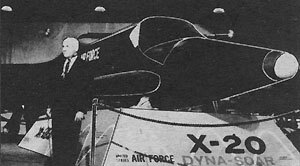 September 1962: Air Force Secretary Eugene Zuckert with a Dyna-Soar mock-up. Dyna-Soar was the first attempt at developing a reusable shuttle spacecraft. test techniques and flying curriculum. Also, there is not the same kind of direct relationship between the sections. The test management covers aircraft modification, systems safety. range facilities, light aircraft, reliability in maintenance, all weather testing and system acquisition. Theory courses cover human factors, stores certification (external equipment, bombs, drop tanks, etc.). radar, electronics, electro-optics/displays, navigation, braking/anti-skid systems, advance simulation and closed loop handling qualities. These differences are due to the almost endless varieties of potential tests. They can range from as complex as an advanced low light level TV system to a new radio antenna. One part of the flying curriculum is a low lift-to-drag landing demonstration in a T-38. Two profiles are flown; one simulates the X-24 lifting body, the other the Space Shuttle. The major emphasis, measured by relative flight time, is the qualitative flight evaluation of unfamiliar aircraft — some ten to fifteen hours for pilots and six hours for engineers. These aircraft, which the students have not flown before, are brought to Edwards Air Force Base along with squadron personnel. The students decide what areas they wish to test. The test plans are reviewed. The staff tries to borrow about 25 aircraft. A tentative list for class 79B includes F-15, F-111, F-106, B-57, U-2, C-141, Navy aircraft such as the P-3, helicopters and even the Goodyear blimp. After the tests, the student submits a two page report on each aircraft. The purpose is to familiarize the student with a wide range of aircraft and their characteristics, and to make him comfortable in an unfamiliar aircraft so that test flights can be made with a minimum of preparation. Because the aircraft must be borrowed, getting them can be a problem. Older aircraft are few in number; also, squadron personnel with a "scarf in the breeze, dive them until the wings fall off view of test pilots can be reluctant to send them precious aircraft. A series of letters and phone calls is needed to reassure them. The Manned Orbiting Laboratory, a USAF project, cancelled in 1969, would have been manned by Test Pilot School graduates. Students for the systems phase are once more divided into data groups. Each data group is assigned a project. These projects come from throughout the Air Force and civilian agencies. They are similar to the missions the students will undertake after graduation. The data groups plan the flight tests. They then present an oral briefing to the staff. The plans are reviewed by the base safety officer. Once approved, the tests are made and the data reduced. The results are presented in both an oral briefing and a written report. The students have full responsibility for all facets of the class project. There are six projects assigned to Class 79B. One is the evaluation of an NT-33 equipped with a side stick controller. The project seeks design information for future systems. Another project will determine the effect of a fly-by-wire control system of a modified A-7 on gunsight accuracy during manoeuvring. One data group will conduct a weapon's certification for a low level bomb drop profile on an F-4. A fourth project will determine if an aft centre of gravity on a KC-135 will result in a saving of fuel. Even 1% improvement will save millions of dollars. This same group will also conduct a test of the KC-135's climb performance with one engine out. The fifth project is to develop curricula for use by trie school for engine out training. The data group will use a UV-18 Twin Otter. The last project is an FA A sponsored study of aircraft altimeter accuracy using a T-38. This is aimed at determining the feasibility of reducing the separation of jets at high altitude. Most of what the test pilots will do will be this type of follow-on tests — filling in the blanks in the knowledge of an aircraft. And so, after 11 months of hard work, long nights and endless study, the graduate has the satisfaction of a difficult job well done. It is best to think of a test pilot as a scientist conducting a controlled experiment. The result will be a series of data points which will be used to graph a curve. The pilots conduct real time analysis. They are trained to feel changes in aircraft behaviour that represent the curves in the graph. The pilots concentrate on flying at these points of change to better define them. The test pilot must be skilled to be able to reproduce the flight characteristics on a reliable basis. He must, also, be a skilled engineer to be an effective part of the design team. Yet this is not the reason the school is so selective or the curriculum so difficult. To be effective, the test pilot must have, in addition to these qualities — judgment. Any competent engineer can develop an endless variety of procedures to deal with a particular situation, each tailored to a narrowly defined set of variables. The test pilot must judge which is the ONE best procedure based on the total situation. A long involved procedure has no place in a tumbling spinning aircraft nearing destruction. He must know what is dangerous and what is not important; does the information sought have a bearing on the tests? Is it in fact possible to get the data? And is the test programme too narrow or too broad or does it simply fail to adequately cover the problem? It is this mixture of piloting skills, engineering knowledge and sound judgment that has proven so successful in the selection of astronauts. I wish to thank Lt. 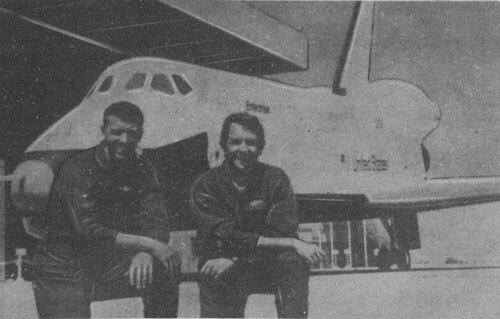 Colonel Larry Van Pelt (66A), Deputy Commandant, Air Force Test Pilot School, Major Dave Edmondson (75A), Instructor Pilot, S. Sgt. George B. Brooks and Dorthy Goode for their time, help and interest they gave me during my visit to the school on 4 March 1980 and on other occasions. Note: Larry Van Pelt has been promoted to Full Colonel and is now Chief of the Engineering Branch of the Test Wing, Elgin AFB. Major Dave Edmondson is completing his tour at the school and is being assigned as a student at the Air Force Command and Staff College. Class 79B graduated in June 1980.